My bedroom in my childhood San Francisco home was situated in front of the house. My middle sister and I shared an adjoining bathroom while my youngest sister’s bedroom was on the opposite end, next to my parents’ bedroom. It was not uncommon when I was in junior high school to see kids sitting on our steps on summer mornings, after our parents had gone to work, before my sisters and I had even opened our eyes. We lived on a dead end street, lots of kids on the block and of the two dozen or so front steps ours became the command center for the kids. This period I’m remembering now I would have been 12, my two sisters 11 and 6. Half the kids were boys and though we had no brothers, they congregated at our front steps, too. We rode our bikes up and down the block, played video games. On an afternoon when there were enough kids around at the same time and willing to join in, our street doubled as a field for a game of touch football. There was a young mom up the street with a toddler who must have considered us all the cheapest babysitting service around for she always felt comfortable leaving her son with us while she disappeared behind her front door for the afternoon. The only boy who never hung out with us was older. He would have been in high school at the time. I secretly had a crush on him and always considered it a good start to the day when I would spot him heading to school or out with his friends from my front window. It’s too bad that the only time he ever looked in my direction was when another neighbor’s skateboard slipped from under me and I crashed on the pavement…in a dress no less. Oh, to the see the pages in my diary from that day. When evening came you would hear “David!” “Stacy!” “Ann!” “Gail!” ringing up and down the block. It was our cue to begin making our way home. Some nights we’d see one of the kids at the front door asking for a cup of sugar or a little flour or whatever ingredient their pantry may have been short on that night. More often than that one of our friends would come to the door bearing a plate of their mom’s specialty dish. They always made extra so they could share with us and my parents did the same. When I arrived at church this morning the attendant handed out a leaflet with the question, “Who is your neighbor?” It was the theme of today’s message about “loving your neighbor as you love yourself”. Do we really know what this means? Who do you consider your neighbor? We were given an exercise. We were to write on a piece of paper the names of our neighbors and what we knew about them. I was not surprised that I was only able to fill in a few names with not much personal details to add next to them. I’ve lived in my home for over a decade but the relationships fostered with my childhood neighbors have not happened here (the only exception was a couple who fast became good friends but they have since moved away and we are happily still in touch). Sure, we are friendly and chat from time to time and receive invitations to each other’s holiday parties but I’ve never seen the warmth and welcome that I’d grown accustomed to and I feel it has nothing to do with the front gates and long driveways. We’re not strangers to each other but we’re not friends either. One time I walked across the street and down my neighbor’s driveway with a freshly-baked dessert in my hands only to be stopped by a closed gate. All was quiet. They were out of town and I didn’t even know it. I walked back home and left a message on their machine just in case a house sitter spotted someone “lingering” by their gate. Despite the extra portions of dessert that night I couldn’t help but feel disappointed in the lack of community in this community. So when the pastor challenged us to reach out to our neighbors I took it to heart. The bigger point of his message was to observe our habits and to examine how, in our daily lives, we “love our neighbors”, really everyone we come across. His way of getting us started was to encourage us to engage those who actually live just steps away from us. I wondered how I would do this with my half dozen or so neighbors, two of them whose names I don’t even know. Children are not a common denominator and they are often the easiest way to build a community. So my mind went to food and how my childhood and (even my young adulthood) neighbors often shared what came out of their kitchen. 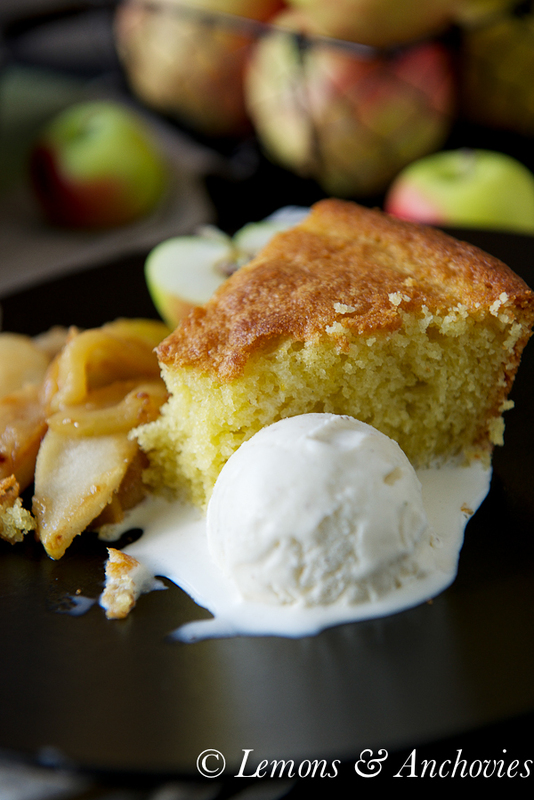 I recently baked this olive oil cake and sautéed some apples and pears to go with it. I didn’t have a 10-inch by 2-inch round cake pan so I used my cast iron skillet with the same dimensions to great results. 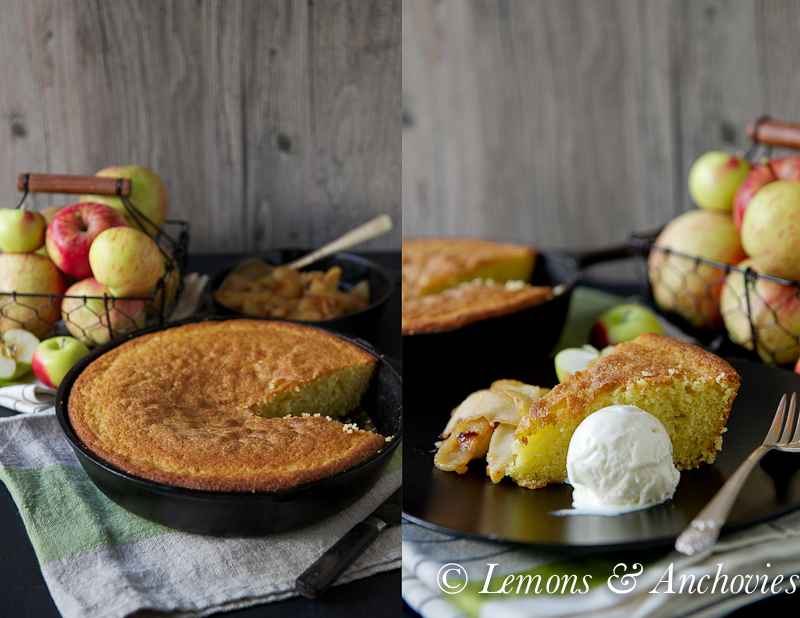 The bottom and top of the cake developed a crust similar to corn bread but inside it was light and fruity and moist from the olive oil. 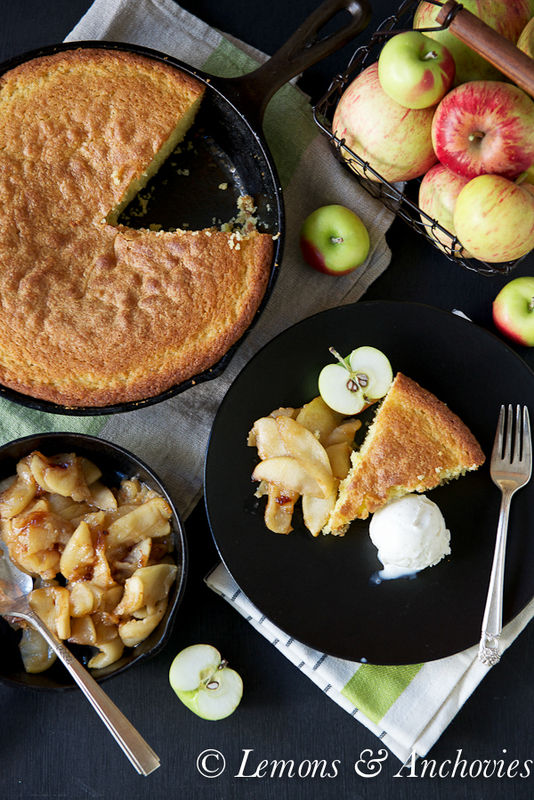 I served the sautéed fruit with it out of an abundance of apples and pears that I’ve been meaning to bake pie with and though they go well together, this cake doesn’t need extras at all. 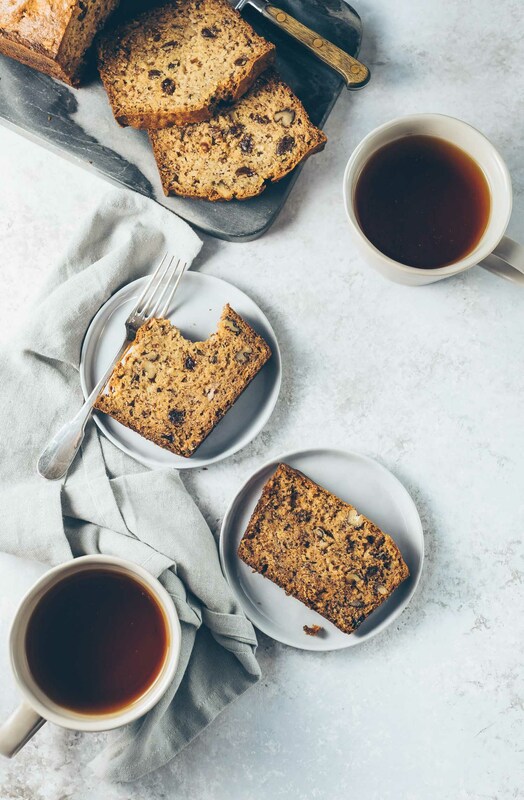 I am partial to olive oil cakes–I’ve shared a few in this blog and this is just as good as the rest of them. This cake might just be the perfect thing to carry to a neighbor’s front door. It’s not pretentious but simple and inviting…rather like the qualities one would want in a neighbor. Better yet, I could walk to my neighbors’ front door and invite them to my home instead to share this cake. Maybe if I became the kind of neighbor I want to have it wouldn’t be long before I would be comfortable asking one of them if they had the right size pan to lend me for my next cake. 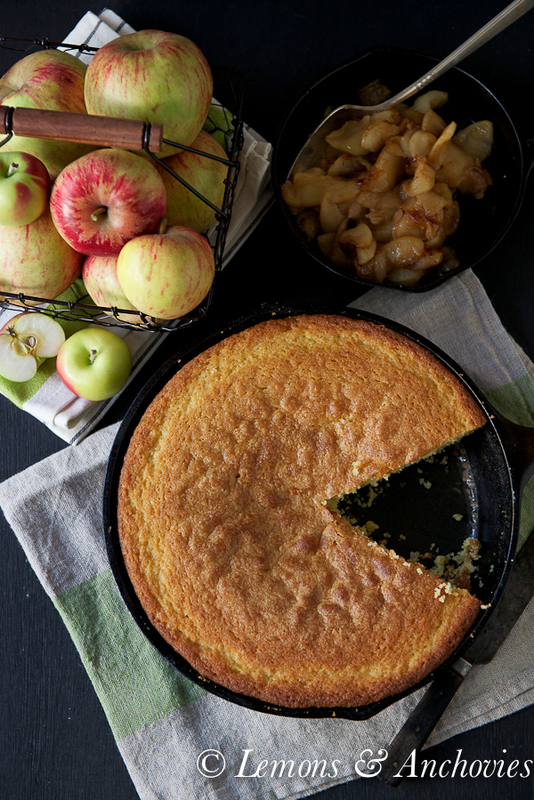 For more rustic appeal, bake this cake in a cast iron skillet. It will look like corn bread but will delight you with how light and moist it is. The perfect cake to share with a neighbor. Preheat oven to 375°. 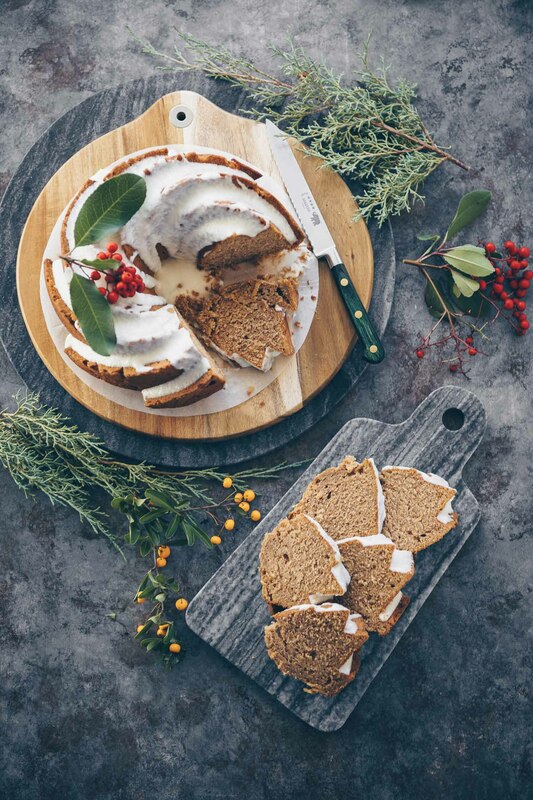 Butter a 10-inch round x 2-inch-deep cake pan or cast iron skillet with the same dimensions. Set a piece of parchment paper inside the pan (or skillet) then also butter the parchment and dust with flour. Set aside. Beat the eggs in a stand mixer using the whisk attachment until frothy. Slowly add sugar and beat on high speed until the mixture is pale and leaves a ribbon when you lift whisk, 4-6 minutes; scraping the bowl halfway through. Whisk the flour, baking powder, baking soda, and salt together in a medium bowl. Whisk milk, oil, and lemon zest and juice together in a large measuring cup. Add one-third of dry ingredients, then half of wet ingredients to egg mixture, beating after each addition until smooth; continue until all are added and stop a couple of times to scrape inside of bowl. Pour batter into prepared pan and set in oven. Immediately turn down heat to 350°. Bake until cake pulls away from pan and a toothpick inserted in center comes out clean, 50 to 55 minutes. Cool on a rack 15 minutes, then loosen cake from pan with a knife. Turn out onto a plate, remove parchment, and carefully flip cake back onto rack. Let cool completely. To prepare the apples and pears: in a medium-sized pan, melt the butter over medium heat. Add the apples and pear and sauté for 3-4 minutes. Add the sugar and cook for another 3-4 minutes or until some of the fruit has caramelized. Serve warm alongside the cake (and ice cream). 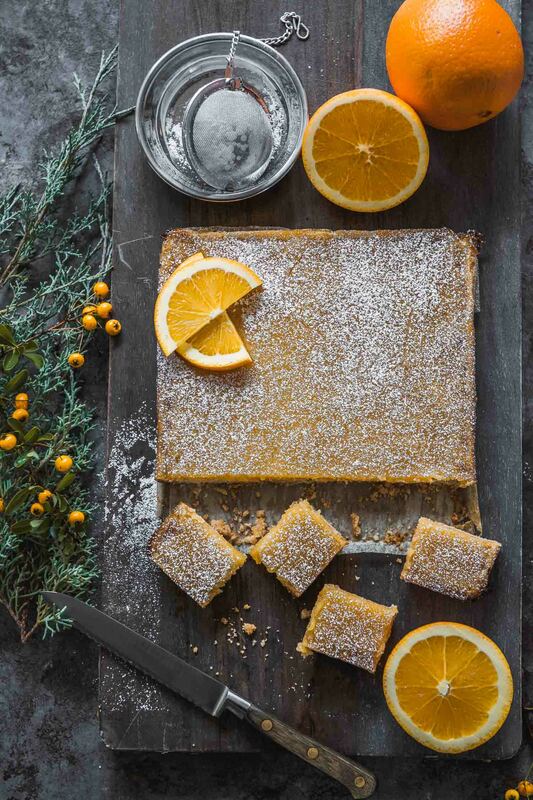 Recipe for the cake from Sunset Magazine. I just reduced the sugar in my version. Beautiful reflection, Jean! I know my neighbors to a degree, and share treats when I can (my next door neighbor often reciprocates by sharing vegetables from his garden in the summer). However, I often feel that I don’t really “know” them to the point where I’m actively involved in their lives, or vice versa. What a great reminder to make the extra effort and really be intentional – I think that’s the start to building community. Your cake is so lovely, just the thing I’d love to share over a mug of hot tea! Goodness, I just love your blog. Your writing and your thoughts about life are so true and often very touching. And then, of course, you wow me with these gorgeous recipes. I laughed as I thought about my own neighborhood crush, and I felt convicted to reach out to the neighbors on my street. Thank you for this moment of beauty and truth! The cake looks heavenly. What a great post! We are definitely lucky with our neighbors, as we all have kids the same age and everyone runs in and out of each other’s homes. And yet, just down the street, they don’t have that same friendship. Beautiful cake! I love all things olive oil! Lovely memories! You were lucky to have such generous neighbors. I have never experienced that with mine. This cake is wonderful! So smooth and tempting. A beautiful post. I just wish we all had the time to communicate more, I just wish the kids had more time to get out and play, I just wish it was safe to send off the kids outside to play by themselves. Those were some great days. I am so glad your pastor came up with a great idea. Fantastic neighbors but just not the same. This post brought back similar memories to my childhood friends and how we ran the block with long games of hide and seek. and endless Summer swimming in my backyard. Oh how I wish my kids had this type of neighborhood to grow up in, but we are far from anyone except my in-laws the next closest neighbor is 1 mile away and we don’t know them well either. There are pros and cons to both ways of living. Wonderful cake and recipe too, and I like how it looks like cornbread very unassuming for sure. i love this recipe. i love everything with olive oil. i wonder if it’s ok to take kosher salt off as where i live i can’t find it. thanks for sharing!